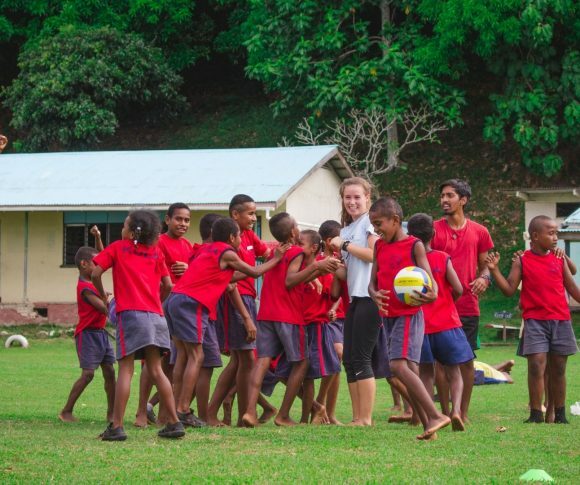 Through groundbreaking partnerships with local stakeholders, you have the opportunity to join a pioneering youth and sports expedition that aims to deliver social, physical and mental development for children living in the rural areas of Fiji. 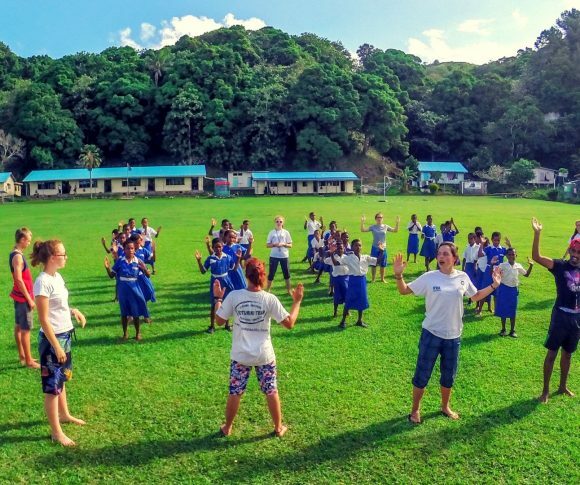 Each team of 20 volunteers shall live in a traditional Fijian village and travel with children to a local sports facility each day to deliver a Sports Camp during the school summer holiday period – planning, preparing and delivering sports coaching, youth activities and educational workshops. Across our university volunteer projects, we saw a 600% increase in sports and extracurricular activities for the children we worked with. With TP you really do put your university skills to the best possible use! Expand your comfort zone by throwing yourself into a “back-to-basics” island experience as you live with a Fijian family at the heart of a traditional village and sample a simpler way of life. Students return with more understanding of poverty issues and of the difference they can make. Swap university exams and course work for adventure and Fijian culture! We find that students develop greater global awareness and learn about a unique culture and way of life as you live and work with local people in the remotest corner of the earth. Gain hands on experience and transfer your degree studies and extracurricular passions as you teach, mentor or coach. sports to children. The experience is something students treasure as you become responsible for inspiring and encouraging children to succeed. Develop teamwork, leadership & communication skills. We deliver aims for the Fijian Government (The Ministries of Health, Education & Sports), which contribute towards national targets. This is something to shout about to employers when you return, developing your CV and expertise. Create memories and friendships that last a life time. Most students join our project on their own & return with a new group of amazing friends. We love the fact that TP becomes a highlight of people's time at university and something they always look back upon with so much pride. Forget about course work or the stress of exams by arriving in the exotic South Seas. You will land at Nadi Airport and be met by your Expedition Leaders for the first time. Leaving your briefing paradise, we travel to your remote traditional Fijian community. Depending on your village, this could be a truck to deep jungle or ferry to an outer island. Arriving into your Fijian village is an exciting and nervous moment! Every door is open in a Fijian community and the generosity and genuine excitement of the local people is profound. By the end of the project our volunteers feel as though they are leaving a second home in the South Pacific. Some of your greatest experiences will be the simple activities of daily Fijian life; learning how to weave palm leaves, cooking Fijian food in underground earth ovens, drinking ceremonial Kava with the chief, husking coconuts or fishing ‘Fiji-style’. We focus upon providing youth and sports opportunities for children living in remote primary schools. You’ll deliver a Sports Camp, coaching a range of sport & lead ‘The House Cup’! The days are rewarding and incredibly busy! Explore your incredible surroundings as we organise guided excursion days. Which depending on your locations could be treks, waterfall visits or beach days. 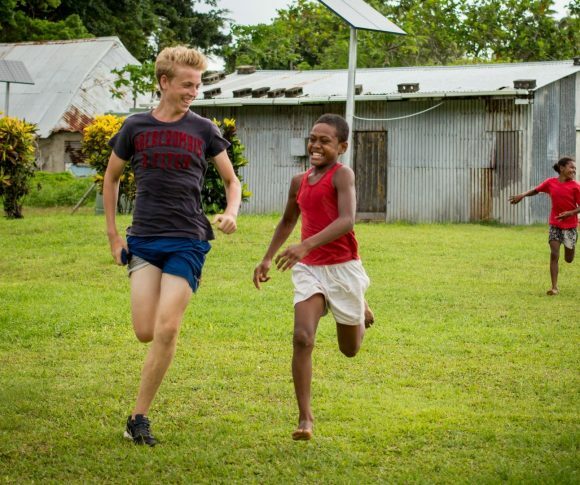 Leaving your Fijian village is an emotional experience; such are the close bonds that are formed between our volunteers and the local community. Farewell dinners, tearful goodbyes and the pride in your achievements will sum up your final days. We finish the project by enjoying our final few days relaxing at Fiji’s glorious beach resorts. Top up your South Pacific tan by the swimming pool, head out snorkelling or go island trekking. During the ‘R&R days’ we ask for your all-important feedback during a final de-brief as we review the project in detail. Think Pacific struck me as being an extremely caring organisation. I was nervous before I went but had phone calls before going out and you were able to email the team with any questions you had, however mundane you felt them to be. In Fiji, we were greeted by Lottie and Lee who were fantastic leaders! They were completely approachable. No tummy ache or random question was ever too much trouble for them. I would certainly recommend Think Pacific to anyone who is willing to get stuck in and has a positive attitude. I would go back in an instant. Hopefully, Fiji and Think Pacific haven’t seen the back of me yet! The think pacific team and the people of Fiji have created memories that i will treasure for the rest of my life. Highly recommend it if you love to challenge and push yourself. Deliver daily sports coaching sessions for children who have never had a PE lesson before. Deliver basic health education workshops on topics such as; nutrition, physical health & sanitation. 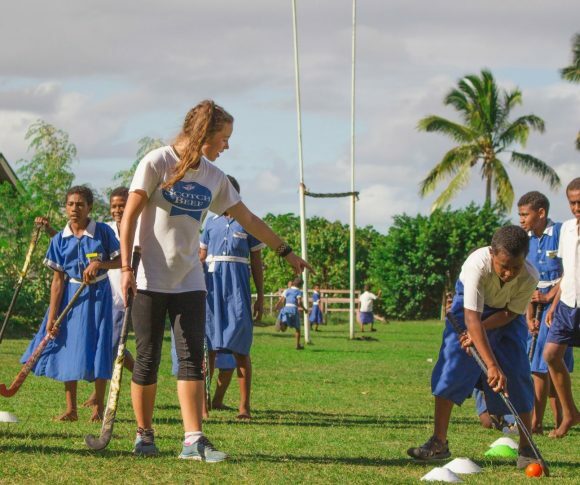 In partnership with the Netball Fiji, help deliver their ‘Net Go’ Program. In partnership with the NRL & FRU, organise Rugby League & Rugby Union sessions. 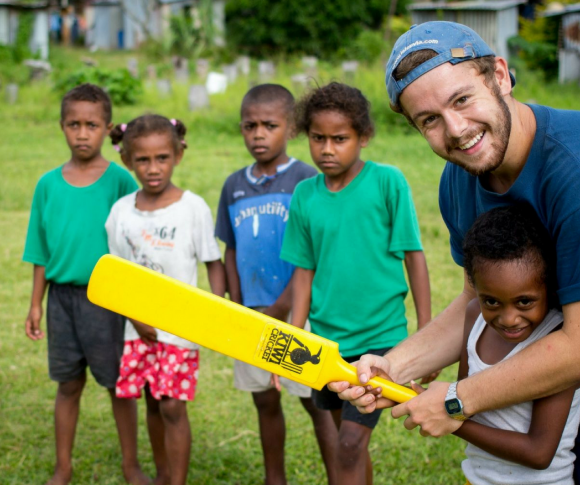 In partnership with the Cricket Fiji, deliver their fun and engaging coaching sessions. 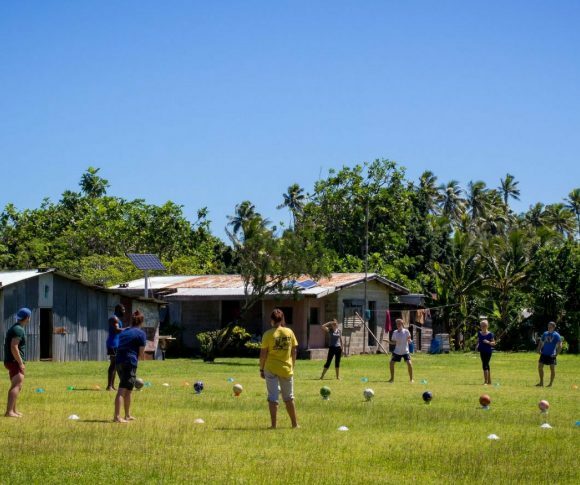 Plan, prepare and deliver basic Soccer sessions for Fijian children. In partnership with the Athletics Fiji, deliver their fun and engaging coaching sessions. 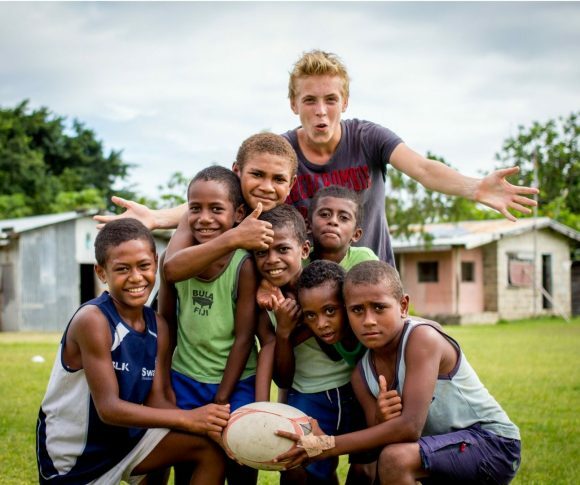 In partnership with the Fiji Sports Commision, deliver their fun and engaging coaching sessions. Our aim is for every student to complete their project with a set of experiences, personal attributes and transferable skills, which can positively impact their future education, career ambitions and transition to life beyond study. If you would like to hear what life is like on project from people just like you, then this video is perfect for you. 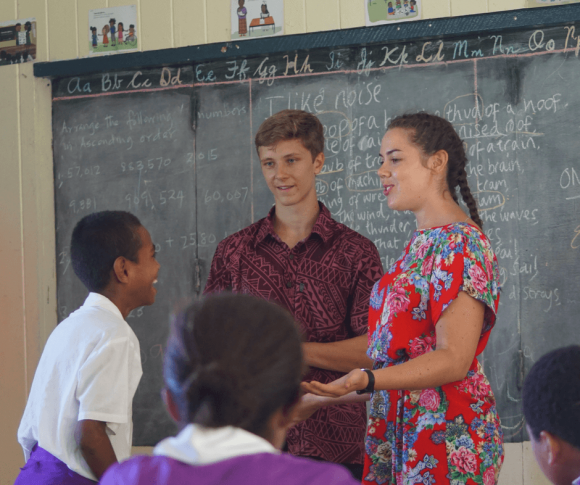 We interviewed a wide range of our past volunteers so you can hear what they have to say about their experiences in Fiji. Want to Watch More Student Stories? Head to the Think Pacific Vimeo Page to watch ALL of our university student testimonials. This secures your place in the team, provides personal support from your project manager, full access to our pre-departure resources and your expedition t-shirt. Your registration fee is additional to your project fundraising. Over 1/3 of your fee pays for the materials and associated costs for the youth & sports project that you complete. In addition, our charity provides long term support to children within the community, improving education and access to health care, sport and extra-curricular activities. Our philosophy is to provide a high quality and exceptionally well structured volunteer project. Our expeditions are packed full of adventure and cultural insight, whilst having safety and support at their core. We also ensure that through our charity, the schools and communities you support receive long-term financial and physical assistance year-round. Think Pacific is not the cheapest volunteer organisation around, but this is for all the right reasons. Airport welcome by Think Pacific Expedition leaders (or resort meet and greet if you arrive early). All-inclusive briefing and orientation from a beautiful beach resort. All meals during your briefing, all meals for 2 weeks staying with your Fijian village family and breakfast and evening meals during your final days of R&R at glorious beach resorts. Guided weekend excursions such as rainforest treks, waterfall visits or island and snorkelling trips. Think Pacific Leaders and Fijian Matanivanua guides living with you 24/7. In-country Director, Fiji based Project Managers and UK team providing planning, risk assessment and 24-hour back up support. Comprehensive pre-departure information & personal volunteer project planning. Fiji expedition de-brief at a selection of beach resorts or castaway islands. 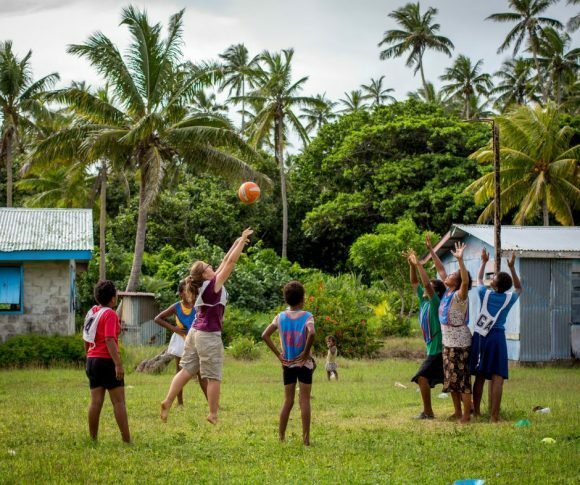 Your project donation towards the youth development goals in Fiji (which is used to purchase educational and sports equipment, fund scholarships and training for local people and build village facilities and school classrooms).